On Saturday we had our annual 'Halloween Party'. 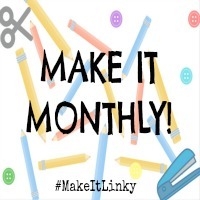 It really just means my little ones, myself and my siblings get to dress up, eat too much junk, dance to silly Halloween songs and play fun party games. It's an easy way to celebrate Halloween with the little ones, without going over the top or having to spend very much. For this year's party, I decided to bake a few treats for us all. 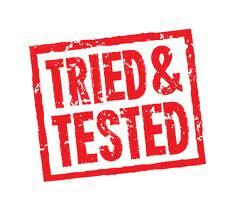 I've recently been experimenting with different gingerbread recipes, and I finally found one that tastes just right! 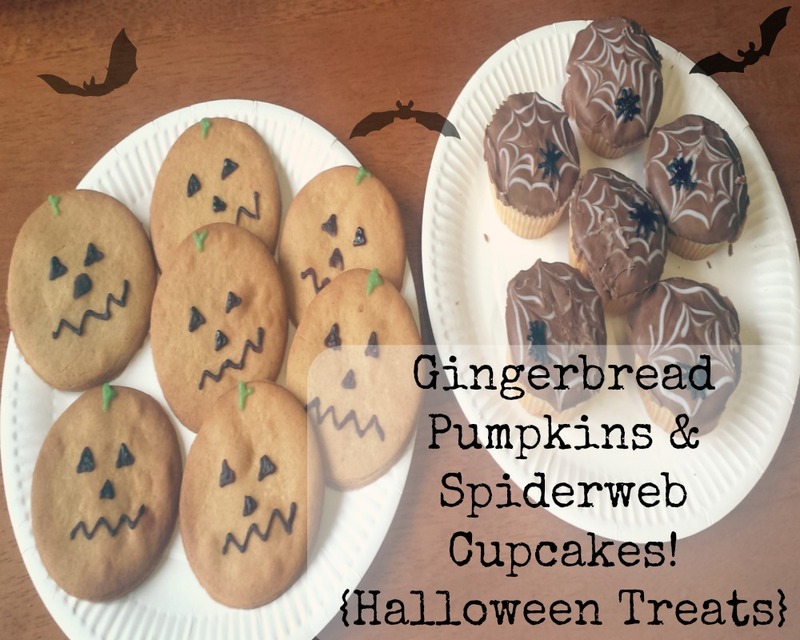 So I'm sharing some fun Gingerbread Pumpkins & Spiderweb Cupcakes today! 1. Melt the butter, sugar & golden syrup slowly on the hob. 2. While that's melting add the flour, bicarb and ginger into a bowl and mix well. 3. Create a well in the flour and pour the melted sugary butter. 4. Mix in well with a spoon, and when it has cooled down enough, use your hands to make it form a dough. 5. Once a dough has been formed, wrap it in clingfilm and pop it in the fridge for 30 mins. 6. Preheat your oven to 190c and prepare a tray with greaseproof paper. 7 After 30 mins, roll out the dough on a lightly floured surface. Roll out the dough to about the thickness of a pound coin. 8. Use a pumpkin shaped cookie cutter, we just used a cup! and cut out the shapes out of the dough, then pop them onto the baking tray. 9. Pop them in the oven for 10-14 mins. Check them at 10 minutes though. They don't want to be burnt or rock hard. 10. Our oven cooks the gingerbread in 10 minutes. Take them out and leave them to cool, they should firm a bit, but still be soft if you press on them. 11. When the gingerbread is totally dry, use black and green icing pens to decorate! 1. Preheat oven to 180c. Mix together the sugar and room temperature butter until they are combined. 2. Sieve in the flour and mix together well. Crack the two eggs into the bowl until they are all completely combined. 3. Pour the mixture into cake cases and pop in the oven for about 25 minutes. 4. Once they are out, let them completely and utterly cool down. 5. Once the cakes are cool, you can melt the chocolate. 6. I tend to melt chocolate in a bowl that is placed on top of a saucepan (the saucepan has a couple of inches of water in, which will boil). Don't turn the hob up too high, about medium, until the chocolate has completely melted. 7. Once the chocolate has completely melted, use a spoon to cover the top of the cakes. Once you have covered every cake in chocolate, grab your white icing pen. 8. Starting at the cake you first poured chocolate on, draw a swirl with the white icing. Use a cocktail stick to drag out the lines of the swirl to create a spiderweb look. Repeat for all the other cakes. 9. 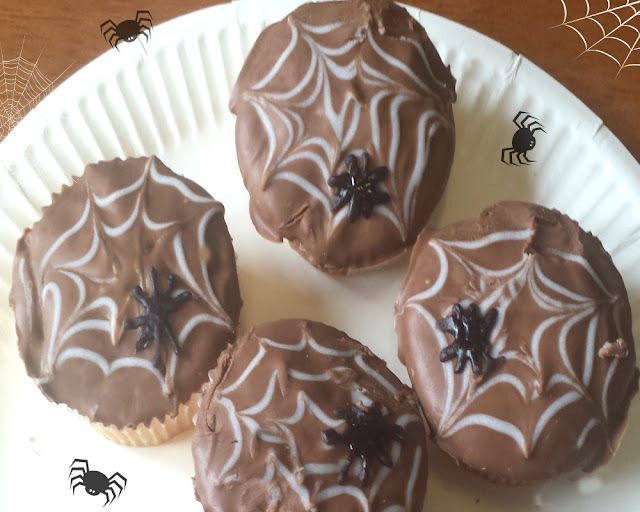 Once the chocolate and icing have completely dried, add a little black spider on each with the black icing! I have to say I'm pretty proud of myself, I am really a terrible baker. Haha. 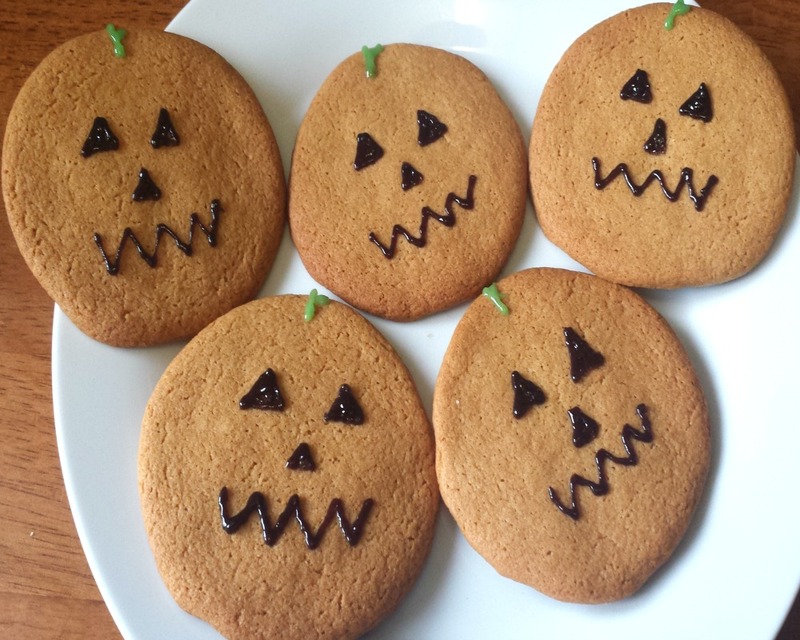 Have you baked any Halloween treats this year?